By all accounts, King Richard III’s reign was relatively unproductive. Modern historians believe that this was mostly due to the dynastic struggle that we now know as the Wars of the Roses, of which Richard III’s house came out on the losing end. As is always true, the victors are afforded the opportunity to write the history of the day, and Richard’s character, (not to mention physical appearance) was besmirched by historians across the centuries…Even the great bard, Shakespeare, had few kind words for the King. It’s only in recent times that historians have begun to look more deeply into the life and times of Richard and begin rehabilitating his reputation. Richard himself was deeply involved in the Wars of the Roses, and in fact, he was the second and last King of England to die in combat. Richard III met his end at the Battle of Bosworth, but his connection to 3D printing begin the night before at the Blue Boar Inn. 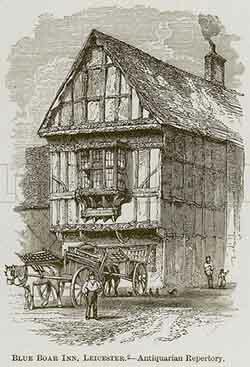 The elaborately constructed, timber-beamed Blue Boar Inn was constructed during the 15th century. The Blue Boar Inn was, for its time, a premier hotel catering to the powerful and wealthy when they would journey away from their estates. On the night before the Battle of Bosworth, Richard III spent the night at the hotel, although he did insist that he sleep in a bed brought from his own castle! The hotel remained in the same spot until 1836 when architect Henry Goddard had it demolished. Until recently, historians and architects only knew of the inn from two engravings and prints of its exterior. On a recent journey, archaeologist Richard Buckley of the University of Leicester discovered one of Henry Goddard's notebooks. Within its pages lay a series of sketches that detailed all of the architectural elements that were used in the construction of the inn. An oddity for its time, Goddard’s notebook so thoroughly described the Blue Boar Inn that Buckley was able to send the drawings to architect Steffan Davies so that a model could be made. Steffan poured over Goddard’s notes and drawings and created a 3D model that was then printed. The results show, in astonishing detail, what the centuries-old inn would have looked like when Richard III spent the night.